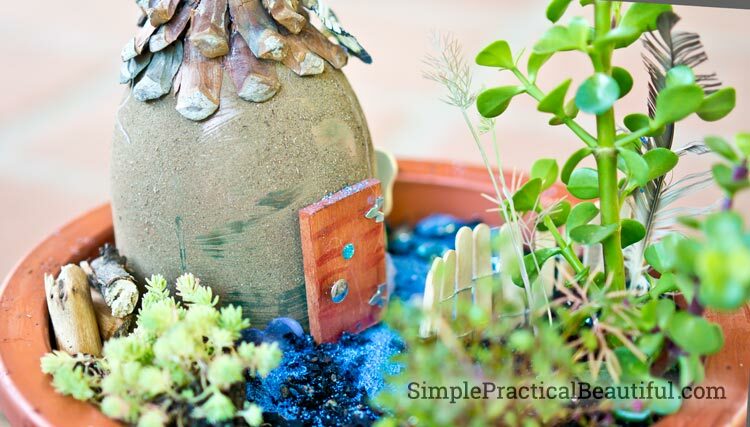 Create your own personal fairy garden in a flower-pot. Fairy gardens don’t need to be big, after all, fairies are small. You just need a flower-pot. 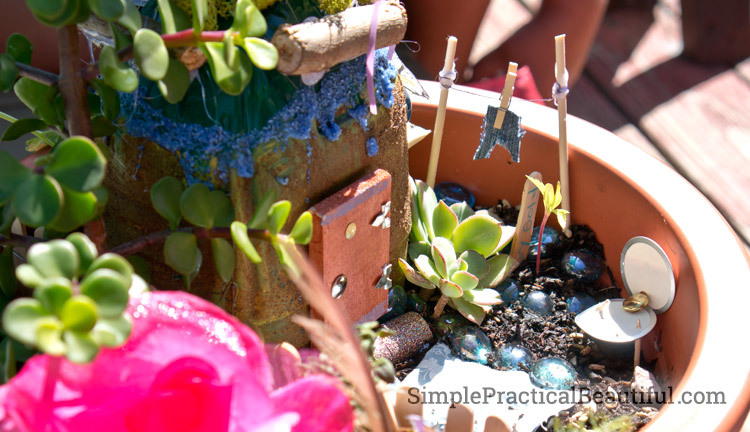 For my daughter’s fairy garden birthday party, each guest created her own small fairy garden in a flower-pot. 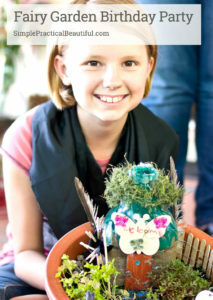 This project is a great craft for kids whether or not your having a party, but it was an awesome “party favor” for kids to be able to take home their own fairy garden. 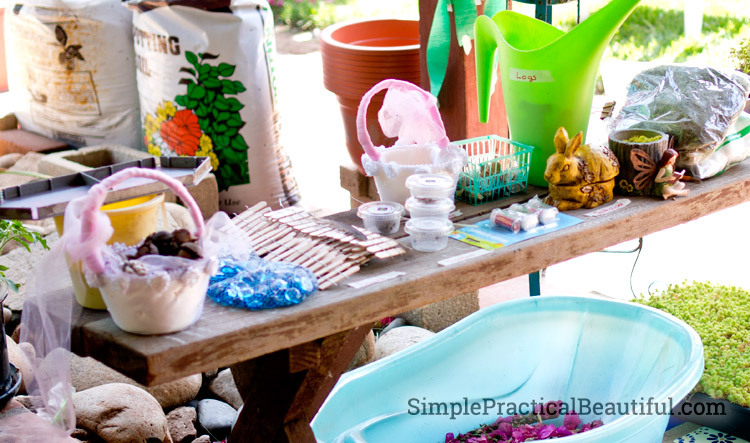 To decide what supplies we would need, I looked through A LOT of fairy garden ideas on Pinterest and on other blogs. 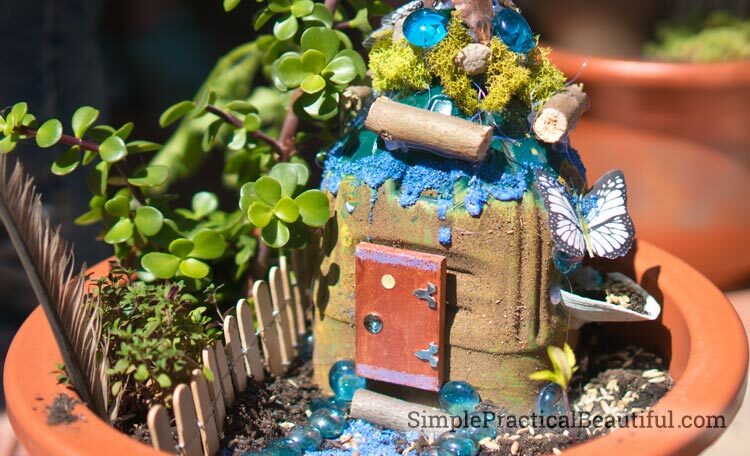 There are tons of cool ideas out there, but too many of them involve buying fairy garden accessories. Since we had 10 kids at the party, it would have been way too expensive to buy everything for each kid. Instead we used what we already had, and purchase just a few things from the dollar store. Just a warning, this list is long. Pick and choose things that look good to you and are easy for you to find. 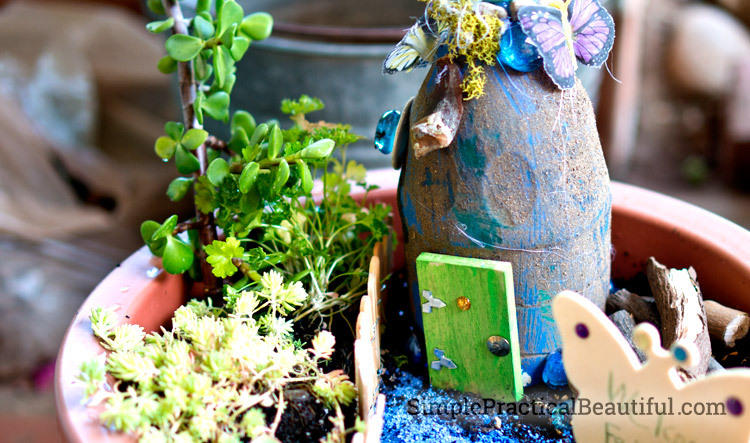 Creating a fairy garden is more about using your imagination than having the perfect craft accessory. Plants are the most important part of a fairy garden, so I’d like to explain instead of just giving a list. 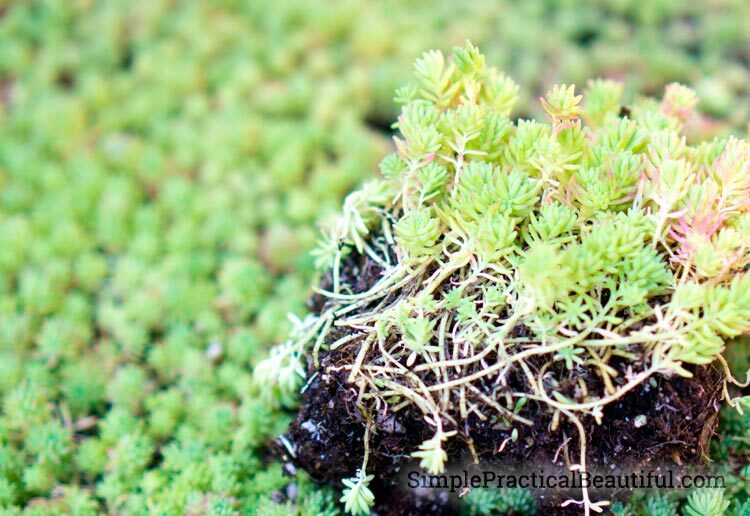 Ground covers make perfect fairy garden plants because they are small with tiny leaves. But at $15 a flat, I only bought one flat. I bought Sedum (a succulent), and it looked really good in the fairy gardens. 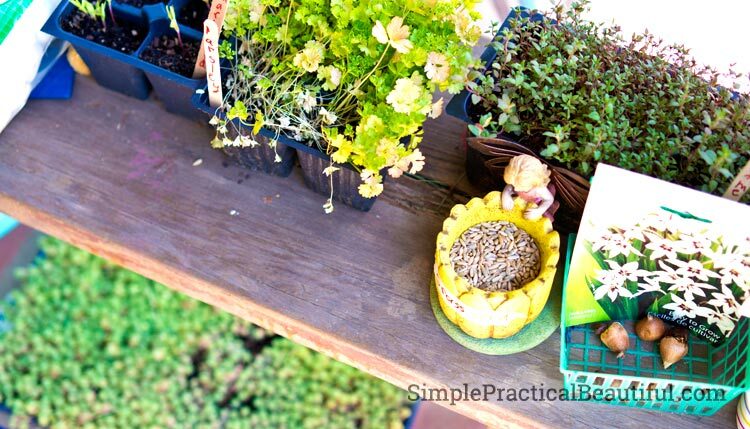 I also bought some thyme, parsley, and dill seeds a few weeks before the party and planted them in some herb flats I had. These were nice because when the plants grew, they were already separated into individualized compartments, so the kids just popped one out and planted it in their pot. We also had grass seeds and some small bulbs that the kids could plant in their fairy garden. Finally, we helped the kids take cuttings from plants around our yard. We have a couple large succulents that we snipped pieces off for the kids to stick in their pot. I also happened to have small tomato plants that needed thinning, so I pulled up several of those for the kids to replant. The kids also got to take cuttings from any plant around our yard that they wanted. Those might take root and grow, they might not. We bought some large, plastic dollar store flower pots. I pre-washed them with TSP so that paint would stick to the plastic, and then rinsed it off well before the party. Some of the kids painted just parts of their pot and let the original design show through, others covered the entire surface with paint. 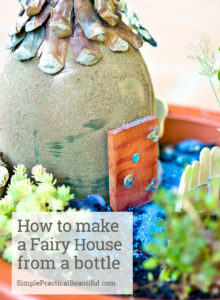 You can read in this post how we made fairy houses out of old bottles and containers. 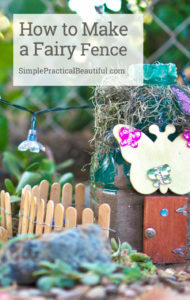 You could also purchase small birdhouses to use as fairy houses too. The kids had a lot of fun filling their pots with potting soil and planting all sorts of plants and seeds. I think kids and dirt just go together. Gardening comes naturally to them. We did find that it helped to put the house in the pot before the plants because it took up so much space. It also looked really good placing the plants right next to the house, so the house was partially hidden. Fairies love nature, so the kids added all sorts of bits and pieces to decorate their fairy yard. The more, the better because the sand, rocks, and wood cover up the dirt, which doesn’t look as nice. Just a heads up, when you first water the plant, a lot of the rocks and stuff will get buried in the dirt a little. That’s okay; it will look lived-in. 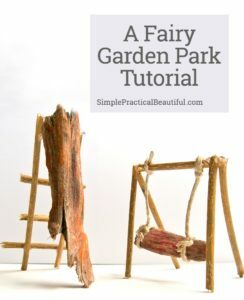 I’m working on a video, or at least a blog post, about how we made these cool fairy fences from popsicle sticks and wire. Stay tuned! 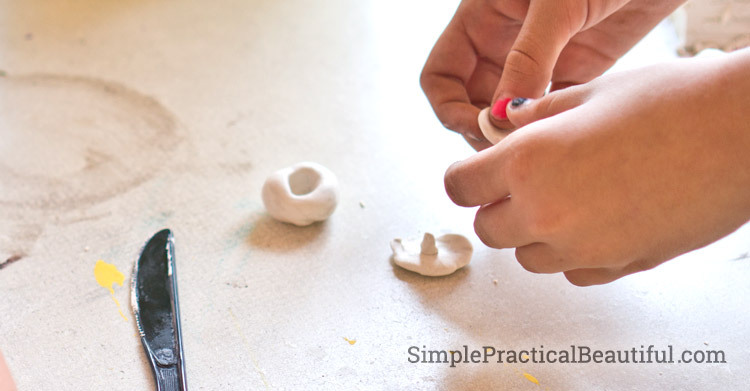 We bought a small pack of Sculpey clay so that the kids could sculpt their own accessories, like mushrooms, dishes, yard gnomes, and animals. Any brand of clay that can be baked in an oven would work. We actually started the party with this activity, so that the sculptures would have time to bake and harden. Mostly the kids made plates and balls, but they had a lot of fun. It’s like play-dough, only more grown up. After the clay hardened and cooled, the kids painted their sculptures then placed them in their gardens. This was an idea one of our guests thought of that everyone wanted to try. Find two sticks, and glue thread between them with a glue gun. Put the sticks about half-way in the dirt to form the clothesline. Cut tiny clothes out of old scraps of fabric, or just flags. The clothes don’t need to be worn, so just the shape of a t-shirt, for example, it fine. 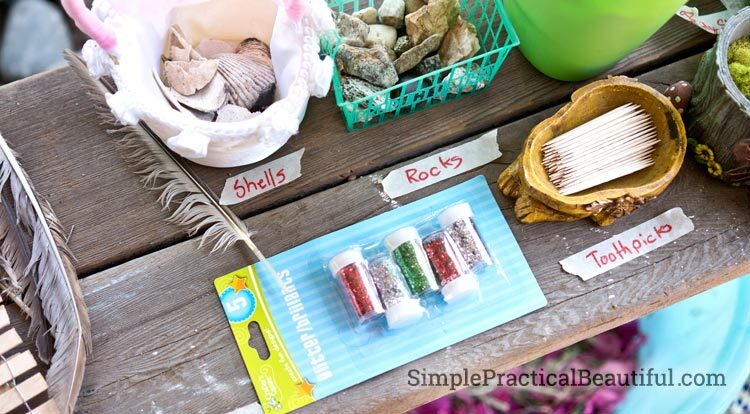 Then use tiny clothes pins, or just paper clips, to hang the clothes or flags on the thread. It adds something interesting to the garden and makes it look like a fairy already lives there. 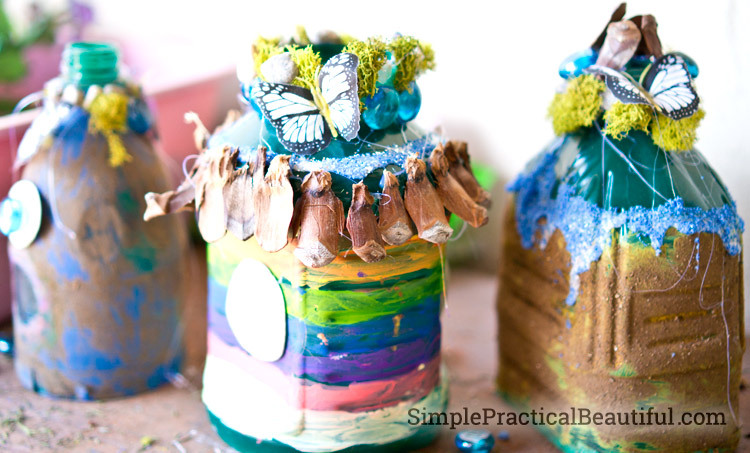 Gems, jewel stickers, and fake flowers and butterflies make the fairy garden fancy and look magical. Some kids even sprinkled glitter around their whole fairy garden and on top of everything. 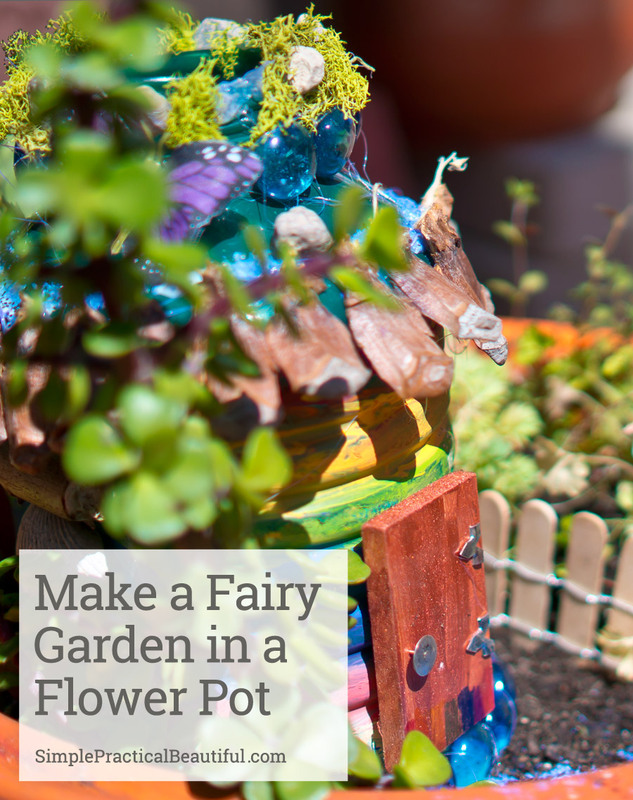 Every party guest had so much fun building a fairy garden in a flower-pot and letting their imagination run wild. Plus, each got to take home their own fairy garden in a flower pot. 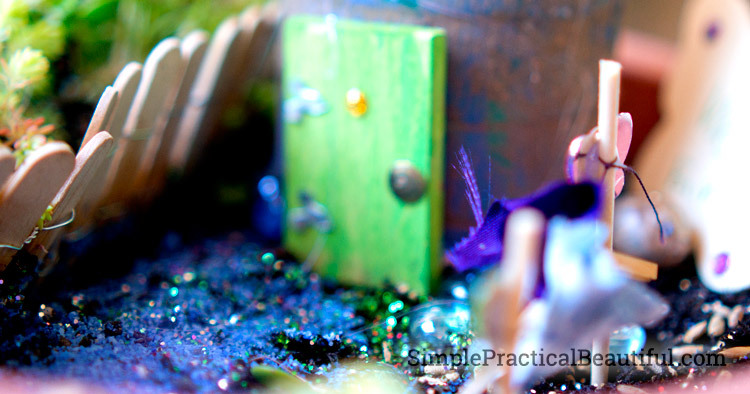 You can read more about planning a fairy garden birthday party here. Such a pretty little idea! Thanks for linking up at our Tips & Tricks Link Party! Thank you, Jessica! And thanks for hosting a fun link party. This is such a cute idea Rebecca. The kids must love this. I couldn’t do it at home because my pots are all full of .. well we won ‘t get into that mess. But I can sit here and admire your pretty flower pots. Thank you, Mary! My kids love making fairy gardens. They’ve taken over most of my pots and patio accessories, but it’s a lot of fun to watch the creativity happen. I’m glad I get to share it. Do real plants have a chance to grow in there? Or do they die very quickly? The plants are mostly succulents, and they’ve done very well in the small pots. 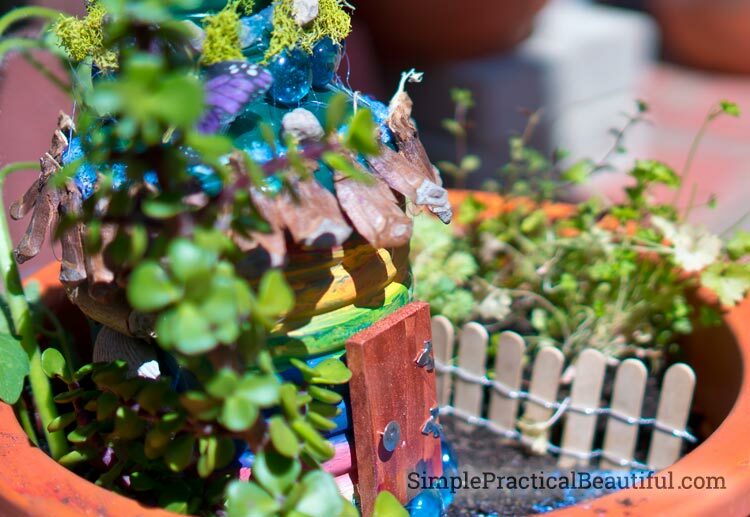 Succulents don’t grow quickly, so they are perfect for fairy gardens.